An Hour a Day Keeps the Jiggle Away! ANNOUNCING: ADVANCED COLD TARGETING TECHNOLOGY! LIPOBELT IS HERE!! COLD THERAPY AT HOME!! And WE HAVE IT! Freeze your fat, break it up and flush it out! Why pay hundreds of dollars for in-office cold sculpting (per body part), that still takes up to 90 days to see results, when you can own your LipoBelt and treat ALL of your areas (thighs, arms, stomach, abdomen) in the privacy of your home at a fraction of the cost! *The retail price for the LipoBelt (inlcudes stomach, arms and legs) is only $379. The results are amazing. Use your LipoBelt with our BioSlimming or European Infrared Bodywrap sessions and enhance your cold therapy result even faster! PLUS, with your purchase of the LipoBelt, you will receive an additional discount on Body Treatment Packages! I’m sure many of you have seen on the news and read articles about the newest way to eliminate fat by freezing them. I do these procedures here at my office. However, I’ve come to realize that many people can’t afford these treatments and are left to keep struggling with muffin tops, love handles, stubborn belly fat, back fat, and embarrassing cellulite. I have now made it possible AND affordable for you to do this fat freezing procedure right in your own home using my LipoBelt MD, a new clinically proven fat reduction device designed to deliver exactly the right amount of cooling to that stubborn, exercise resistant fat. 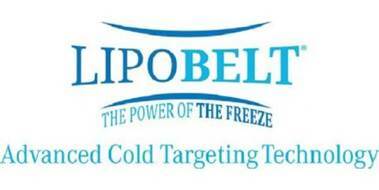 LipoBelt MD uses Advanced Cold Targeting Technology cold packs that have been precisely developed to reach and maintain the target temperature to chill those fat cells, triggering natural fat cell death, without harming skin and tissue. Within days after each LipoBelt MD use, your body will naturally metabolize and flush out those dead fat cells from your system. The remaining fat cells will eventually shift and condense down to a thinner fat layer, gradually diminishing your muffin tops, love handles, back fat, and even smoothing cellulite! Most people see results, and feel their jeans or clothes fit better in just a couple of weeks. It takes time for the body to naturally process and eliminate the dead fat cells, which can vary with each individual. But within a short time you WILL begin to see a more contoured body! With routine use, you can safely and naturally keep eliminating those stubborn fat cells for significantly better results! In just 1 hour a day for 3 weeks, LipoBelt MD can banish that stubborn belly fat, muffin tops, love handles, back fat, AND even cellulite – all those areas that never seem to go no matter how hard you workout or diet. Q. What will I feel while I have the LipoBelt MD on? A. Your target areas will increasingly feel cold during the first 15 minutes. After this initial few minutes, those areas will feel slightly numb. Your body will eventually adjust to the cold and neutralize. Q. Do I exercise while I have the LipoBelt MD on? A. No, LipoBelt MD is designed to work best while doing very little activity such as watching tv, reading, using the computer, or talking on the phone. Q. What type of results can I expect to see using the LipoBelt MD? Q. When will I start to see these results? A. Each person’s body responds at varying rates to LipoBelt MD’s Advanced Cold Targeting Technology. Results are gradual and subtle at first, though some people can experience results as early as 2 weeks, and up to 12 weeks. Q. What can I do to enhance my results? A. It’s important to help your body flush out the damaged fat cells by drinking plenty of water regularly. Massaging the area(s) you are targeting periodically increases circulation and helps to rejuvenate the target area(s). Routine use of your LipoBelt MD will also increase results. Q. Will I lose weight using LipoBelt MD? A. LipoBelt MD is not intended to be used as a weight loss product. It aids in body contouring and targeting stubborn fat areas. Q. Is the product safe to use longer than 20 minutes? A. When used as directed, LipoBelt MD is completely safe for continuous use. There are no known adverse or long-term side effects from cold therapy. A. You may experience any of the following, all of which are minor and temporary, and depending upon each person’s level of sensitivity to cold, will typically resolve within several minutes: redness on the treated areas that will subside after 20 minutes or so mild numbness from the cold or altered sensation that will subside after 10 minutes or so slight tingling on the treated areas right after use tenderness to the touch on the treated areas right after use Can you get ice burns or frostbite by using the product? LipoBelt MD is designed to provide a barrier against ice burns or frostbite. When used as directed, the product is completely safe. As instructed, do not allow the cold packs to come into direct contact with the skin. Q. Do I have to take any kind of supplements or follow a strict diet? Q. How is LipoBelt MD different than other belt products? A. LipoBelt MD uses Advanced Cold Targeting Technology that cools and destroys fat cells, which your body naturally eliminates. Other belts tone your muscles by electrical muscle stimulation (EMS), or causes sweat and fluid loss by heat. Q. What should I do if a chamber inside the cold pack deflates? A. If a chamber goes flat or disappears, there is no cause for concern; the pack will not leak. However, for best results, we advise that you order a replacement. Q. What should I do if my cold pack gets punctured or leaks? A. The cold packs can be punctured by sharp objects, pets, or other disturbances. They can also be damaged if they are dropped onto a hard surface while in their fully frozen state. Eventually it will start to leak. Throw the damaged pack away and order a replacement. It is a good idea to periodically check your cold pack for leakage. Remember that condensation is not the same as leakage. Q. My cold pack leaked, and I now have a stain on my clothes, carpet, chair or bed sheets. What should I do? A. Our cold packs are strong and durable, but they can occasionally be punctured or leak. To remove any stain caused by leakage, follow the instructions for cleaning the material in question. The fluid inside the cold packs will typically not cause any staining. * Note: Before starting any new diet or exercise program, it is advised that you consult your doctor. *Results vary. Consult your physician before combining this program with any other treatment. Average waist circumference change over four weeks in a test group of men and women was 1.38", and an average thigh circumference change of 0.77" in women only. Adding a healthy diet and exercise helps increase and maintain your results. An increase in sugar/carbohydrate consumption may potentially cause excess fat storage, and enlarge the eliminated fatty areas. LipoBelt MD is only effective on areas that are treated as prescribed in the program. Results should not be expected on areas where LipoBelt MD is not used. For fat loss on other body areas and/or to lose significant weight, diet and exercise is needed. Before starting any new diet or exercise program, it is advised that you consult your physician. Designed, hosted, and copyright © 2003 - 2015 Massage on the Web. All rights reserved.